Over the past 100 years, a patchwork of services and care have evolved to support returning veterans and their families. The largest and most well-known is the Department of Veterans Affairs (VA). But other federal agencies also provide services, including the Departments of Defense, Labor, Education, Health and Human Services and the Small Business Administration. In addition, states and many localities as well as more than 40,000 veteran-serving non-profits and other charitable institutions provide a wide range of services and care. Given this bewildering array, how can a veteran sort out what’s helpful? And how can public and private entities best prioritize their resources to be effective? A new report for the IBM Center by researchers at Syracuse University’s Institute for Veterans and Military Families offers a set of building blocks to transform this patchwork into a network. Background. The VA has crafted a compelling strategic plan for how it will serve veterans. But the report’s authors note: “no mechanism exists to establish priorities, resources, and responsibilities across the federal government and align federal efforts with those of the broader public (state and local), private, and non-profit sectors working to serve the veteran community.” They found that current federal efforts to support veterans focus on one or a small handful of issues facing veterans – suicide prevention, opioids addiction, homelessness, job training – and not the whole person. This doesn’t meet the needs of veterans and it doesn’t adequately engage the many community-level resources available. Building Block One: An Appropriate Inter-Agency Collaboration Mechanism—that sustains leadership engagement and participation, effective cross-agency planning and collaboration, and accountability for implementation actions. A key recommended action is for the White House to establish an overarching interagency group on veterans’ services and care that would align existing federal policy, multi-agency councils, task forces, committees, and programs across the federal government, under the direction of the White House Domestic Policy Council. Building Block Two: A Comprehensive Vision of How to Deliver Effective Services and Care—by understanding that the challenge of supporting veterans is multi-dimensional and should be defined in terms of meeting a range of needs—such as health, education, employment, family, housing, and income supports—rather than each need in isolation from the others. The proposed interagency group would develop a “whole of nation” enterprise approach organized in a veteran-centric fashion. Building Block Three: A Coordinated Set of Agency Core Competencies—by allocating effort and responsibility across agencies based on expertise, capabilities, and mission focus. The first step would be for the proposed interagency group to develop an inventory of existing federal programs and “journey maps” to understand how veterans interact with various federal services in order to rethink the roles, missions, and responsibilities of different agencies and programs. Building Block Four: A Robust Engagement Strategy with Community-Level Stakeholders—by regularly engaging with state and local governments, nonprofit organizations, and private sector stakeholders supporting veterans at the community level. A key action to doing this would be for the individual federal agencies involved with the interagency group to increase the use of “business models that promote localized innovation, coordination, and bottom-up engagement in communities,” according to the report. Building Block Five: The Effective Use of Technology and Data—by harnessing technology solutions that capture the perspectives of disparate actors, facilitate sharing of information and insight, and enable data-driven decisions in strategic planning and service delivery. An important step would be to coordinate disparate data sharing initiatives and prioritize greater flexibility and interoperability across federal, state, local, and nonprofit entities serving veterans. Conclusion. 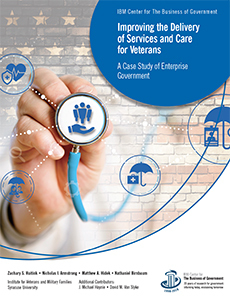 The authors conclude that government benefits and services for veterans are insufficient to meet the range of needs that veterans may encounter post-service. They note that many needs are social or local in nature. They quote former Defense executive Michelle Flournoy’s admonition: “veterans don’t come home to federal agencies; they come home to communities, and meeting their greatest needs often falls on the shoulders of county and city organizations.” As a consequence, they see communities as the center of gravity in the delivery of care and supportive services – and that the existing patchwork of programs and services need to be woven into a community-centric network.